Your gnome self looks great! 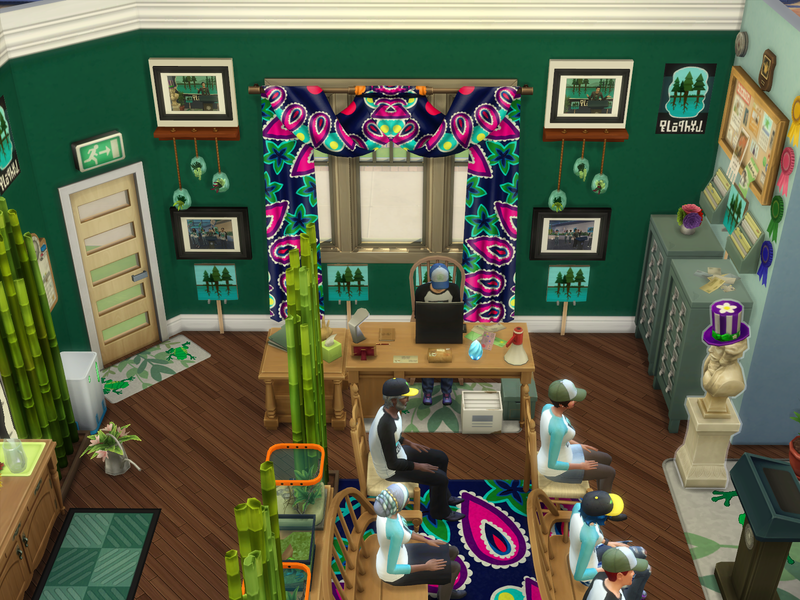 It is great that you are wearing kitten themed headwear and the cooking apron looks great! 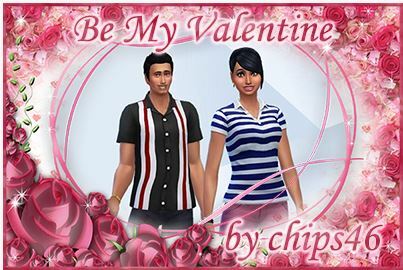 It sounds like a fun sims challenge! 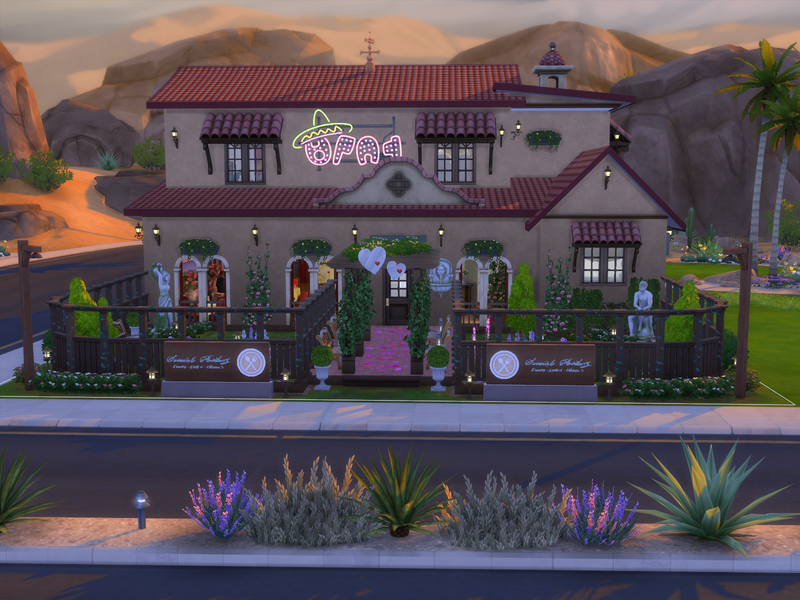 The exterior design and layout of Two Hearts restaurant looks very nice! Very nice trellis covered front entrance area! 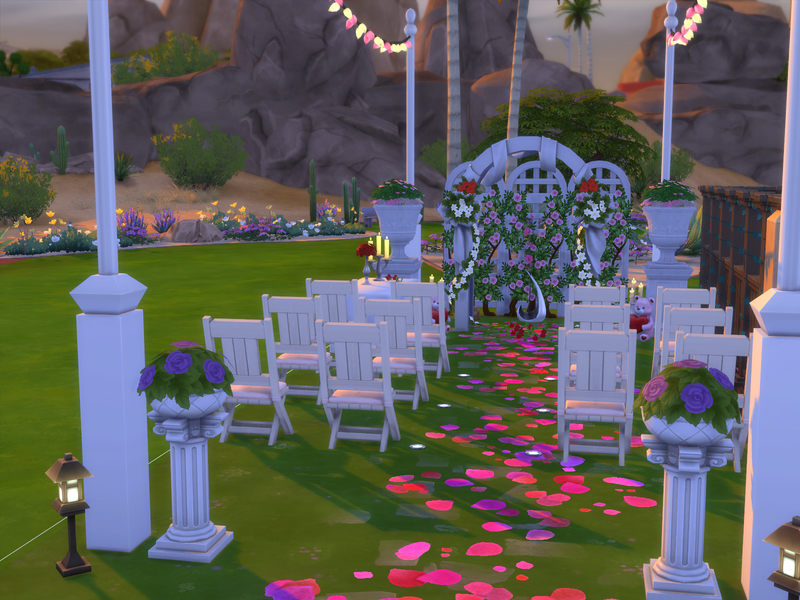 The hearts over the entrance area and floral petals on the floor looks very pretty! The seat benches look nice on the sides of the area . The flowers in the front garden areas and on the wall, and the statues there looks very nice. 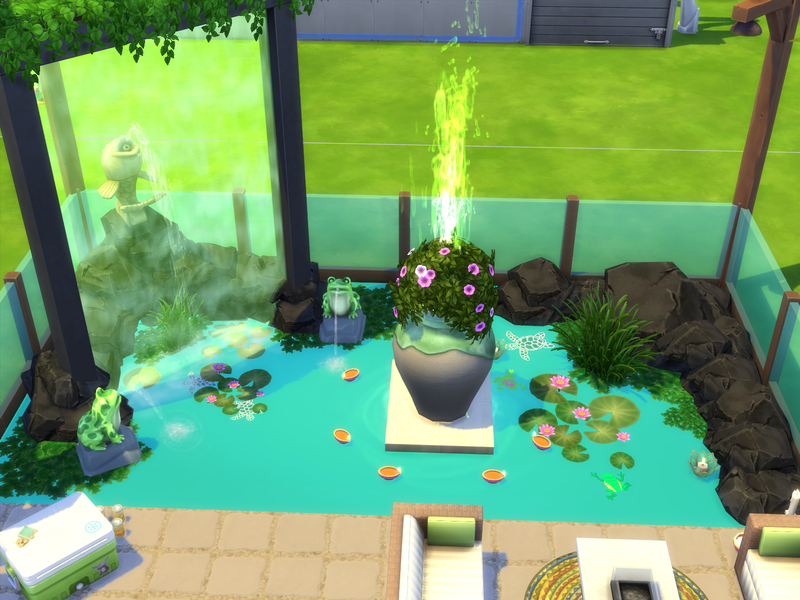 The water fountains are very nice! The ceramic awnings over the windows look great! Very nice furnishing of the interior of the venue! 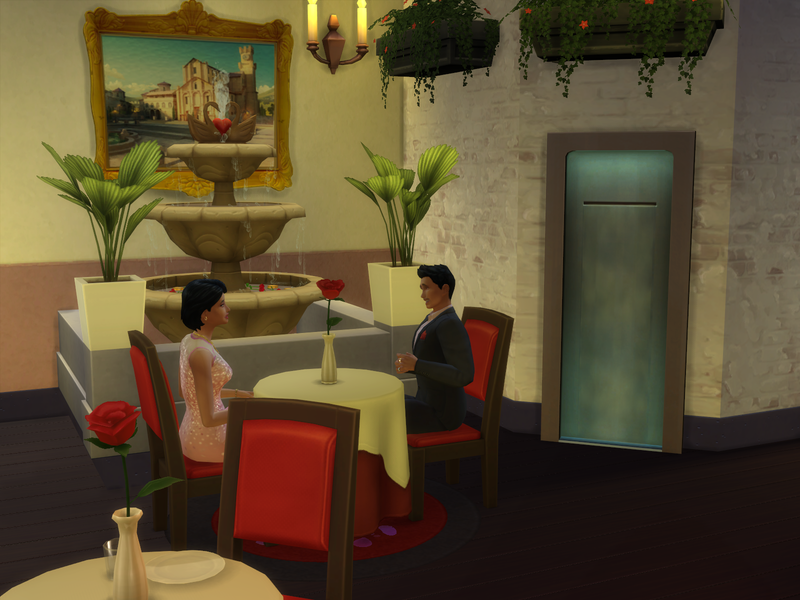 It looks very nice how the white round dining tables and red chairs have been set up for the sims to enjoy eating meals there. The red roses are romantic touches on the tables. They will enjoy having food and drinks from the buffet table and fountain. The music platform stage is great! 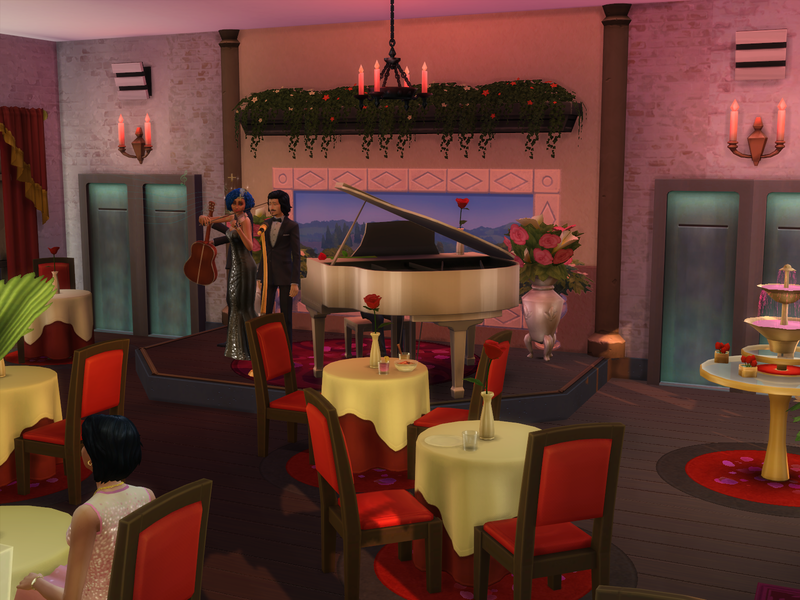 Sims will enjoy listening to the music whilst dining. 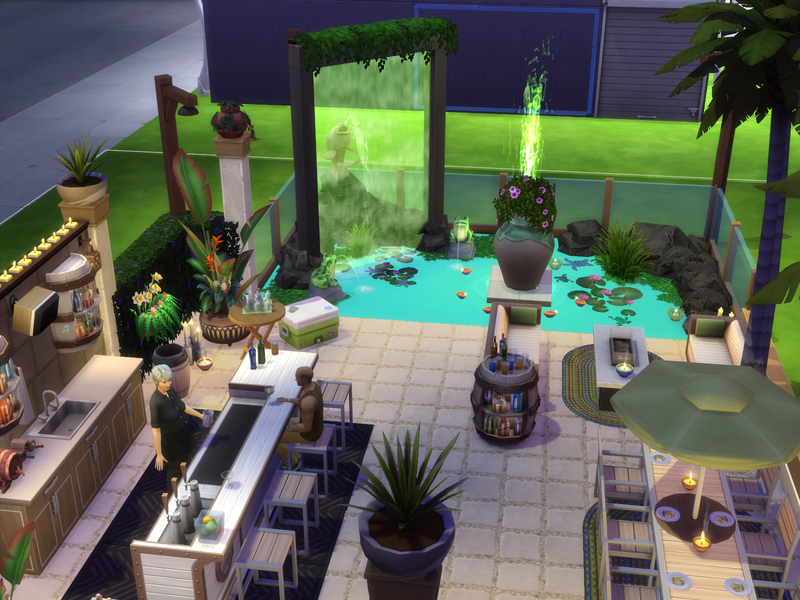 The water fountain and swans feature in the corner nook looks very nice ! 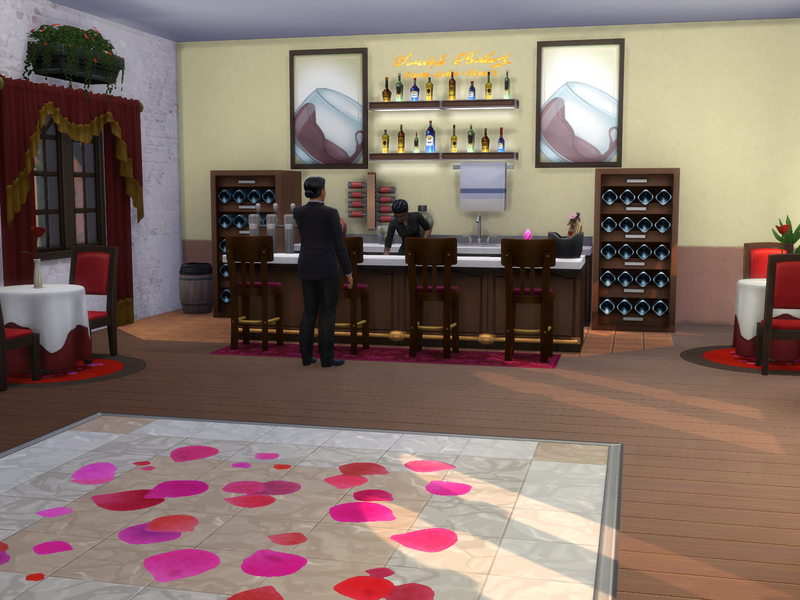 Very nice bar counter area! The wine glass pictures, bottles wall shelves , drinks bucket on the counter and the nectar racks either sides of the bar area look great! 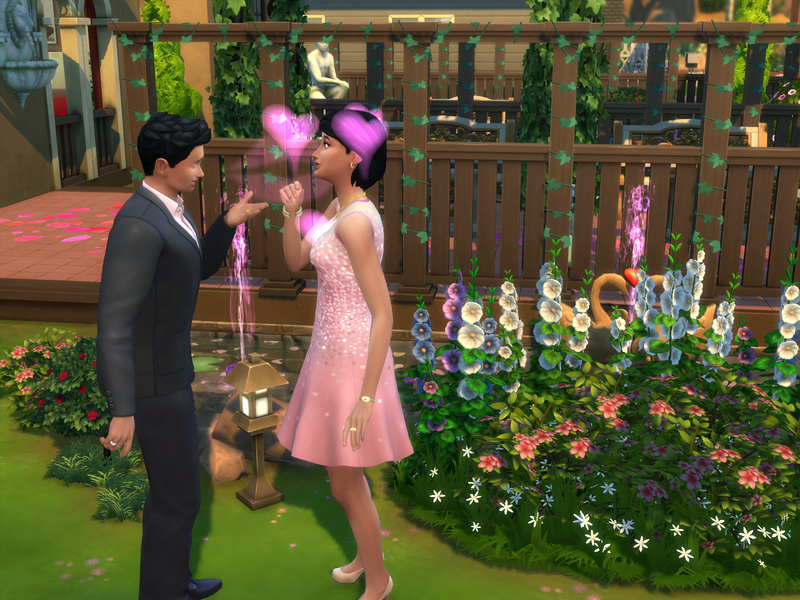 Sims will enjoy dancing on the floral petals dance floor! 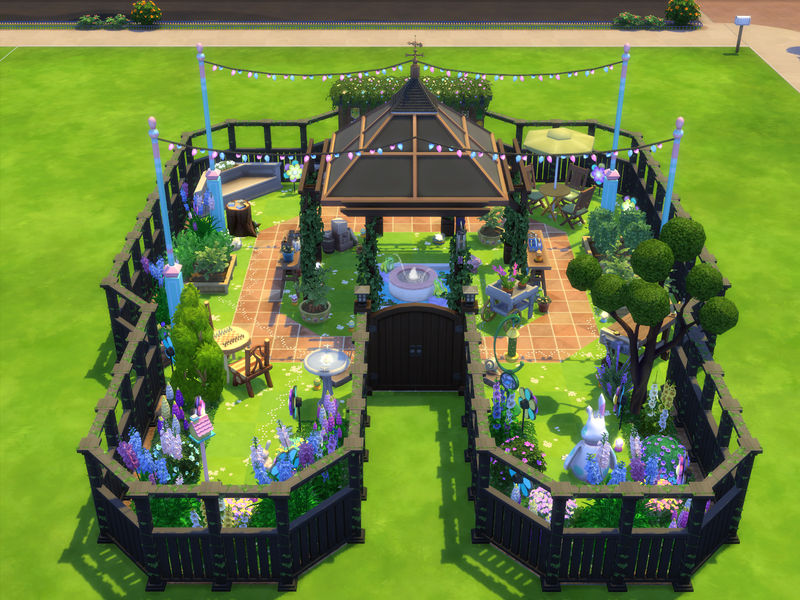 The design of the wedding area looks very pretty! The flower petals on the aisleway are very nice! Margaret is very pretty and Andew is very handsome! 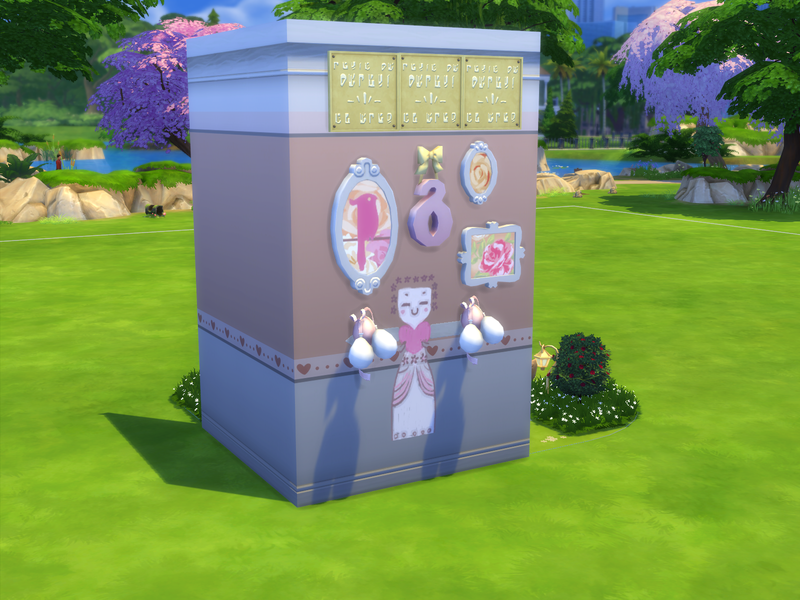 Valentine's CardChallenge is a very pretty room! It is very creatively designed! The pink wall decor, girl prnt and balloons are very nice touches on the cover of the card, and the design of the noughts and crosses game on the inner of the card looks so very creative! You have designed it well! The hearts, flowers, and birds look pretty there on the other side of the card! 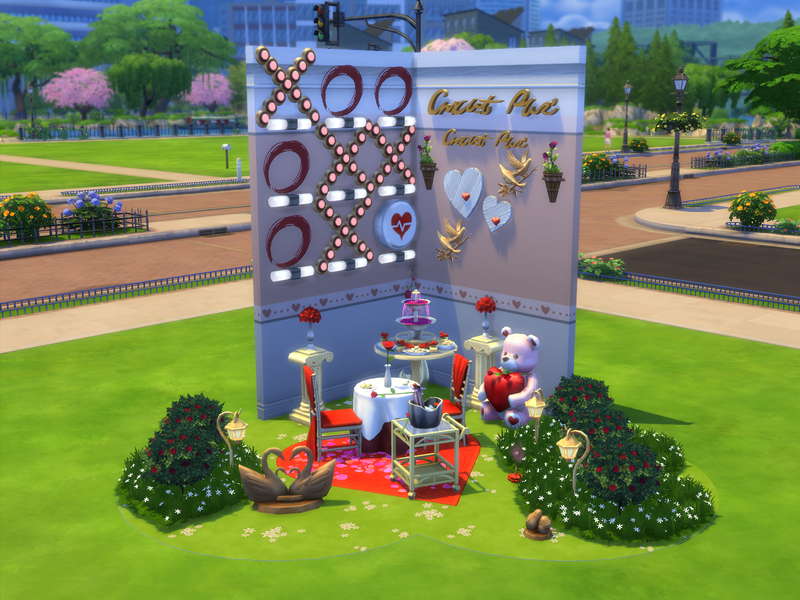 Very nice valentines dining nook! 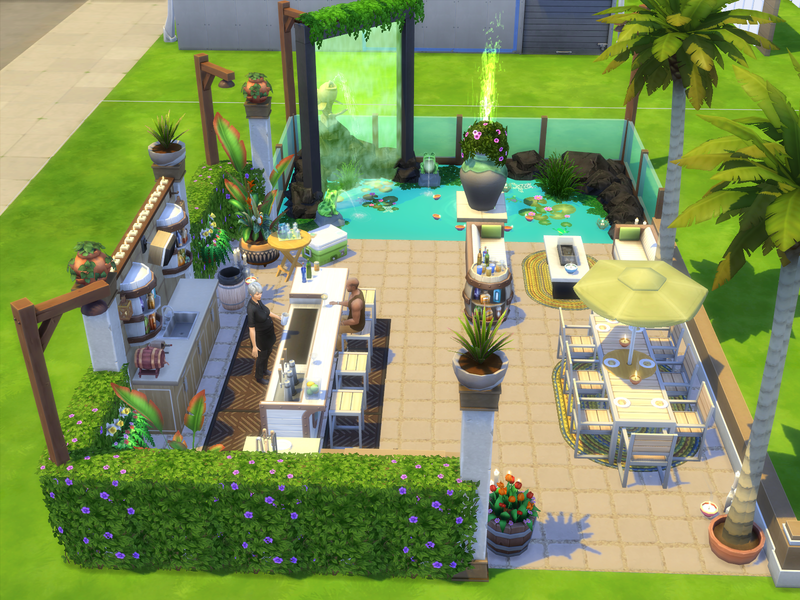 Sims will enjoy sitting on the red seats having food and drinks from the buffet table and fountain in the sunshine. The heart teddy is cute! The red flowers are pretty on the pedestals and heart shaped floor print under the table is very nice! . They will like having a drink from the drinks bucket with their meal. The woodwork swans look very nice there . 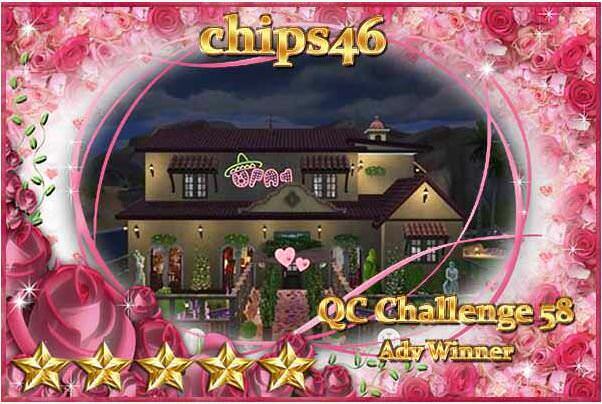 It is very special Valentine’s Day card room! 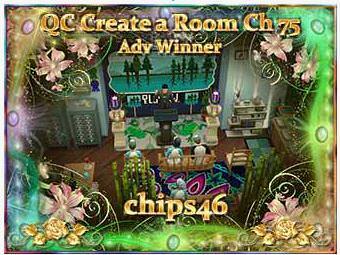 The Broken Dreams Challenge Room is a very sad and dark room You have reflected your theme very well! The mannequin dressed in a white wedding dress for a wedding which she will never attend , wedding gifts that will never be opened and the roses on the floor evokes a sad emotion. 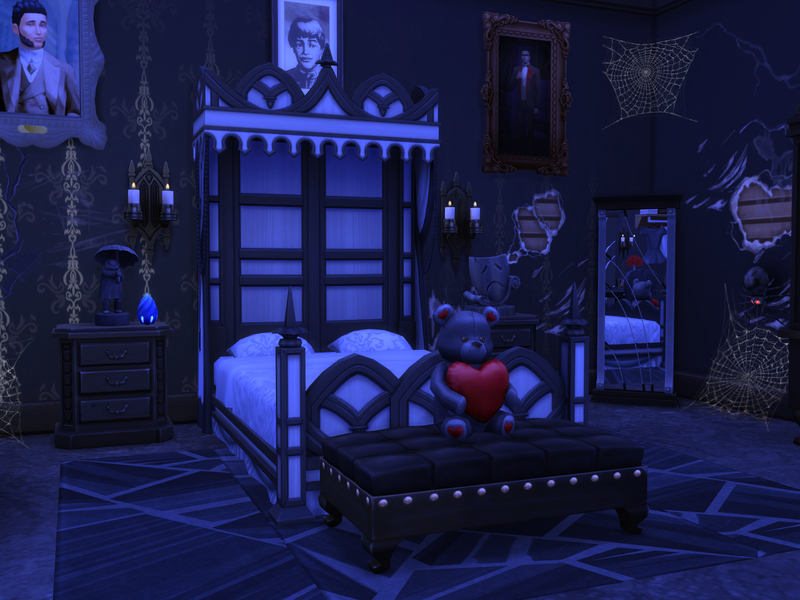 The cobwebs,spider and torn wall areas looks great! The heart teddy is touching as it seeks to offer some comfort for the lady in her brokenness. 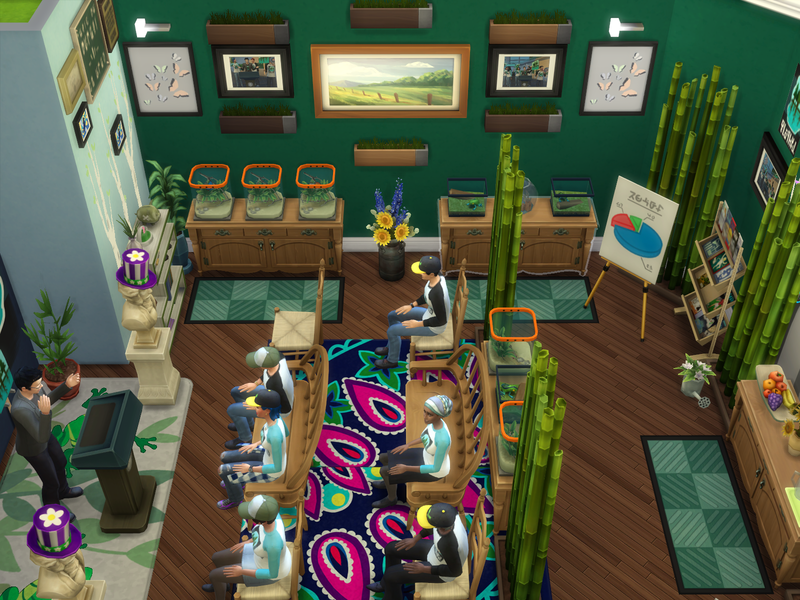 The cracked mirrors are very effective in the room! The black walls and the darkness with no lighting suits well the theme. You have designed the room well. 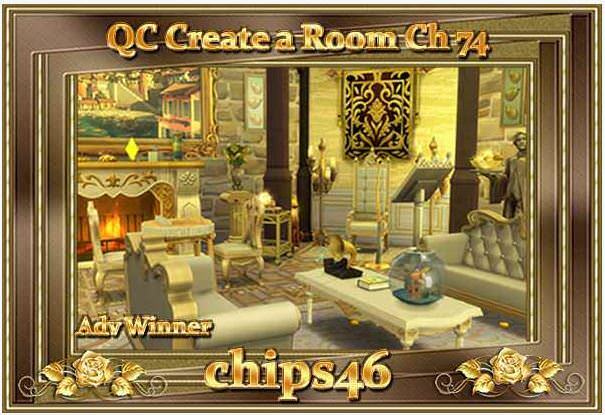 King Midas Gold is a very ornately golden room! 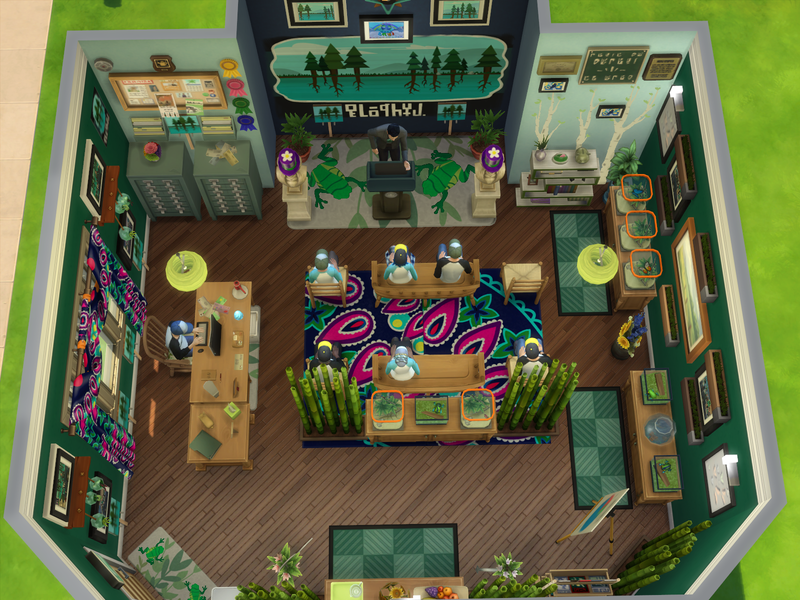 The furnishing of the room looks very nice! 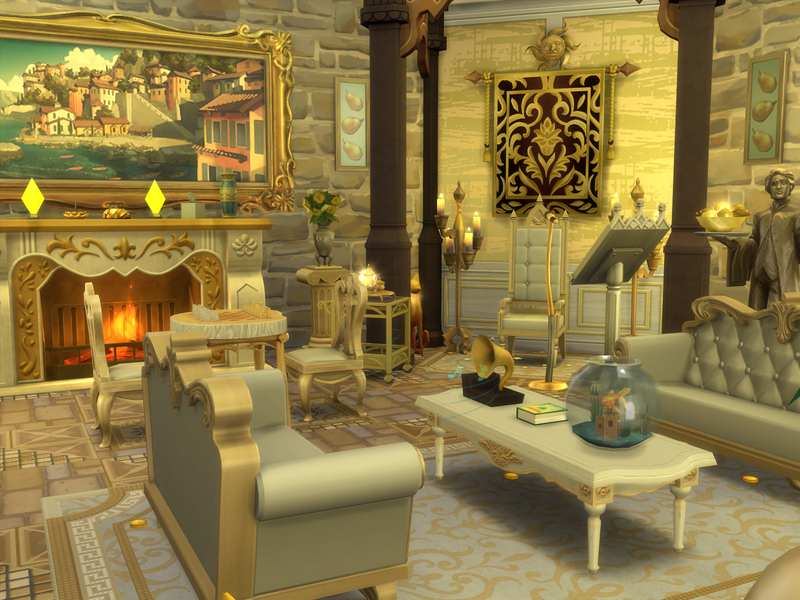 Very nice golden throne area! It looks very nice how the golden spandrels separate off the area. 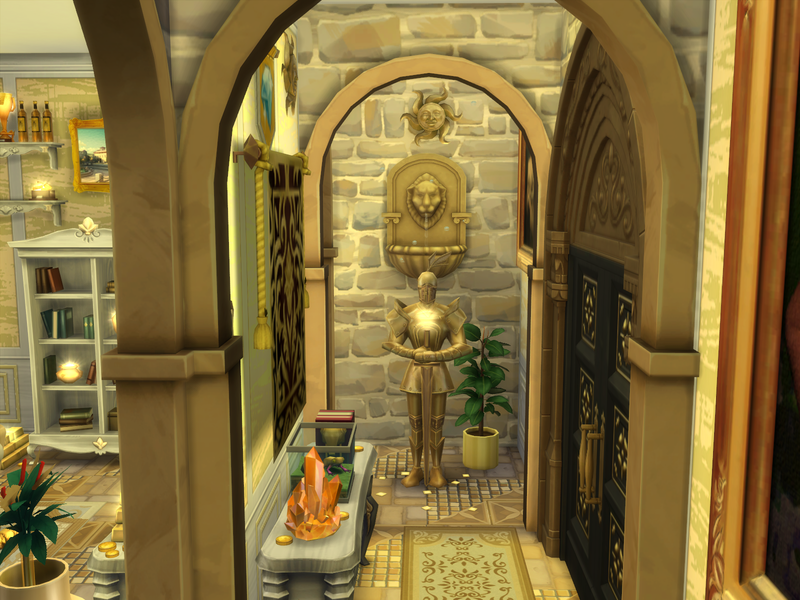 The tapestry and sun look great on the throne wall, and the candles are nice touches either sides of the throne. The King wall enjoy playing chess in front of the fire or enjoy resting on the golden sofas reading a book , having a drink from the globe bar and listening to music through the golden gramophone. 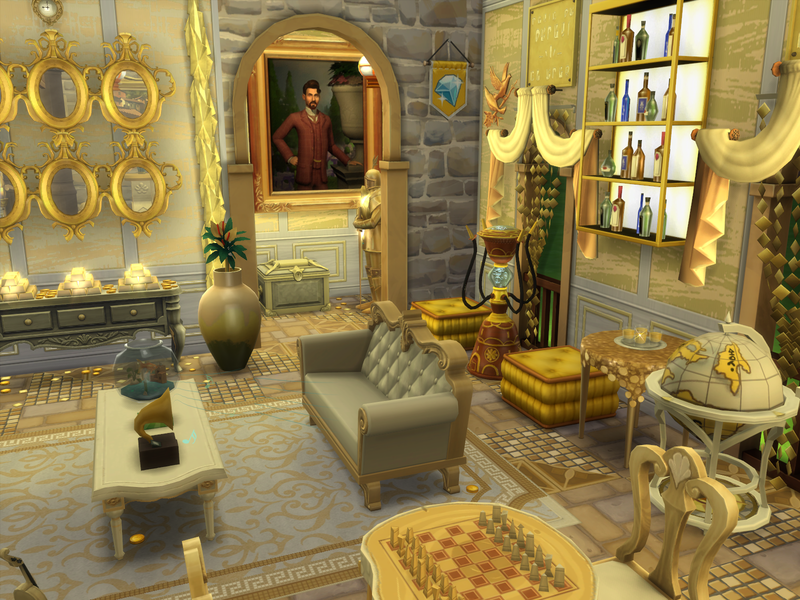 The wall area with the golden mirrors and gold bullions on the table looks very nice! 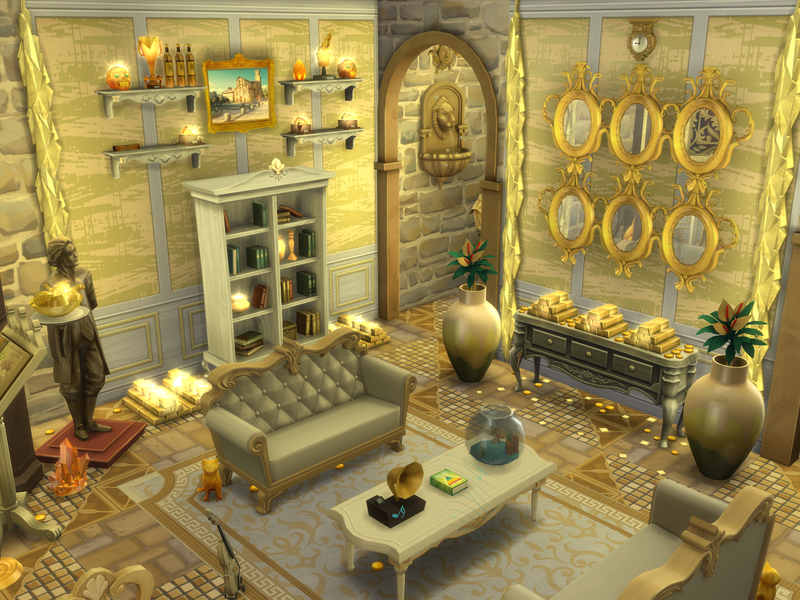 The gold bullions look very nice either sides of the bookcase, and the golden items are nice touches on the shelves above the bookcase. Very nice golden floor patterning ! It is nice that the bubbles machine is in the room for him to enjoy using. It is a nice touch that the waiter statue is holding the golden fruit bowl. 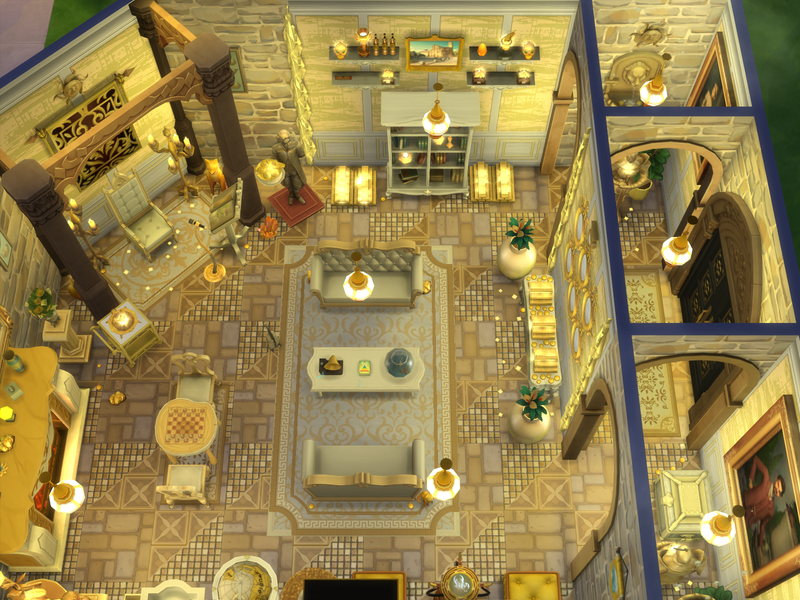 Very nice layout design of the room! The archways entrance area design looks great! 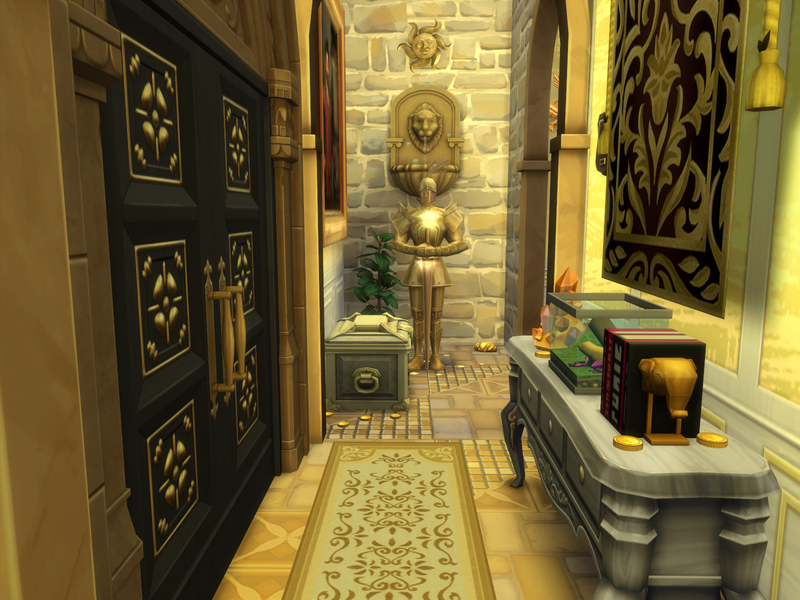 The ornate doors used for the room looks great! It is a great touch that the King will see his golden treasure chest as soon as he enters the room! The knight is guarding it! It is very nice room for a golden King! 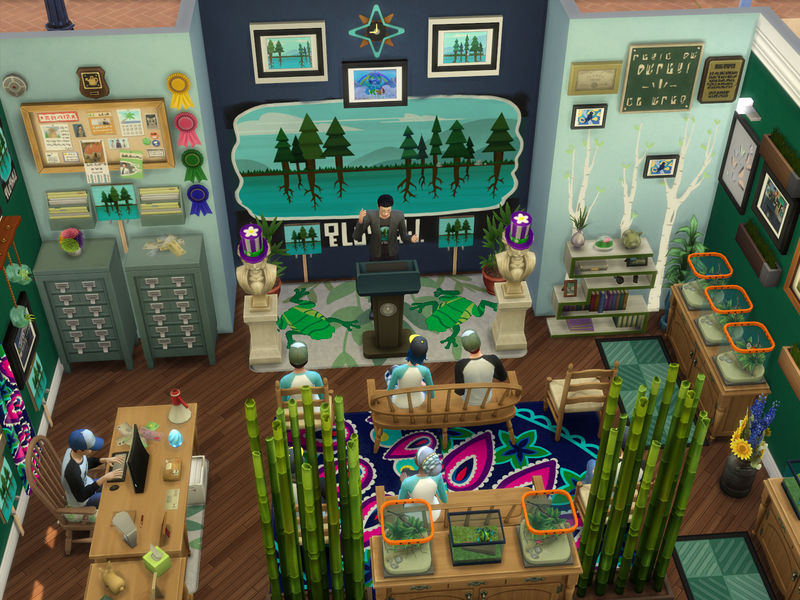 This challenge is in the game gallery that I entered its hosted by Elocine54 and it's called ~Sim Ambassador Chall~The 13 Osmiscan creator gods are worried: so many sims roaming the woods,sampling wild plants,stealing relics & artifacts,disturbing Selvadorada 's harmony! 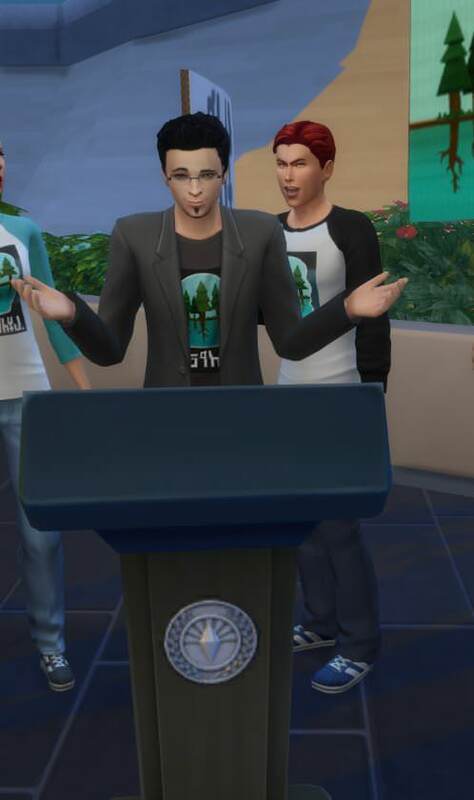 They sent Yum Kaax-god of the woods & wild nature to select a sim-ambassador, who will be taught the proper way to show the example. 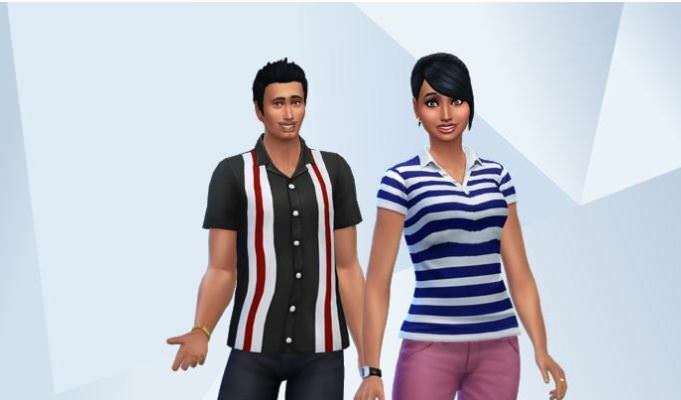 the Rules: for this challenge was to create a 1- sim any gender nocc with positive traits 2-explain why sim is fit for this task. 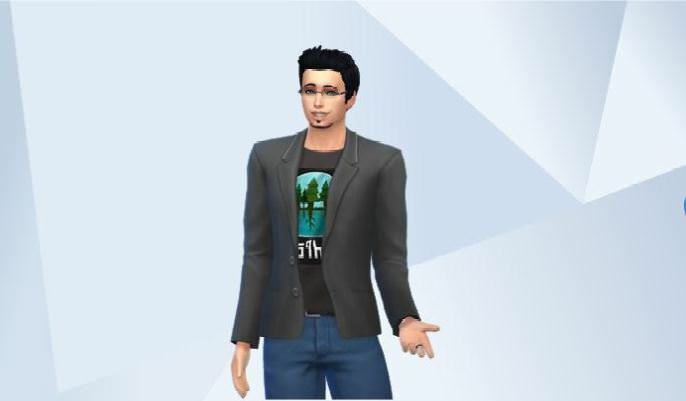 I love all of your creations! So inspiring! I especially enjoyed all the Plan2Build and The Block ones! And they were Australian, too! Keep up the good work! 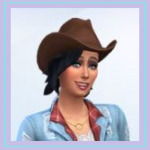 I've bookmarked this thread so I can always be up to date when you post a new lot! 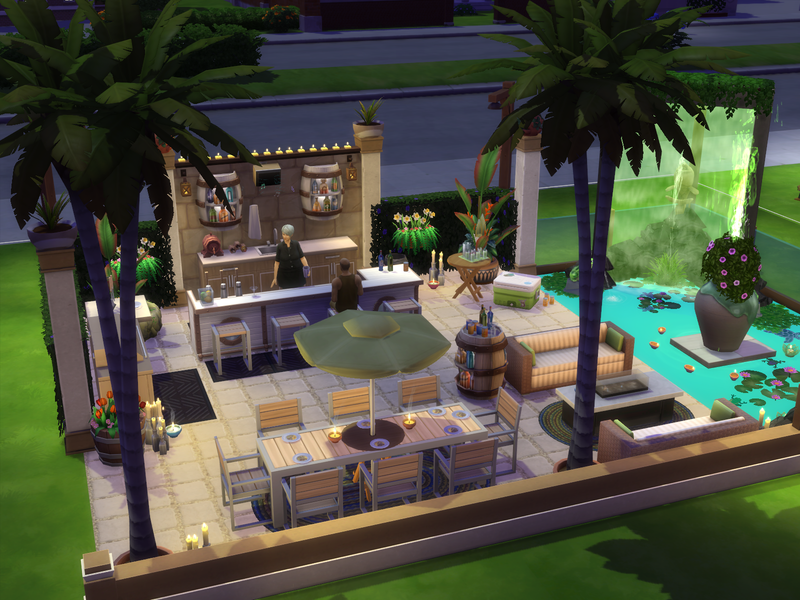 Congratulations on Outdoor Patio bar being favourited by Maxis! That is exciting! Activist New Office is a very nice and very detailed room! It looks great! It looks very nice how you have designed and set it up for an activist! The photos, posters and paintings are very special touches on the walls! 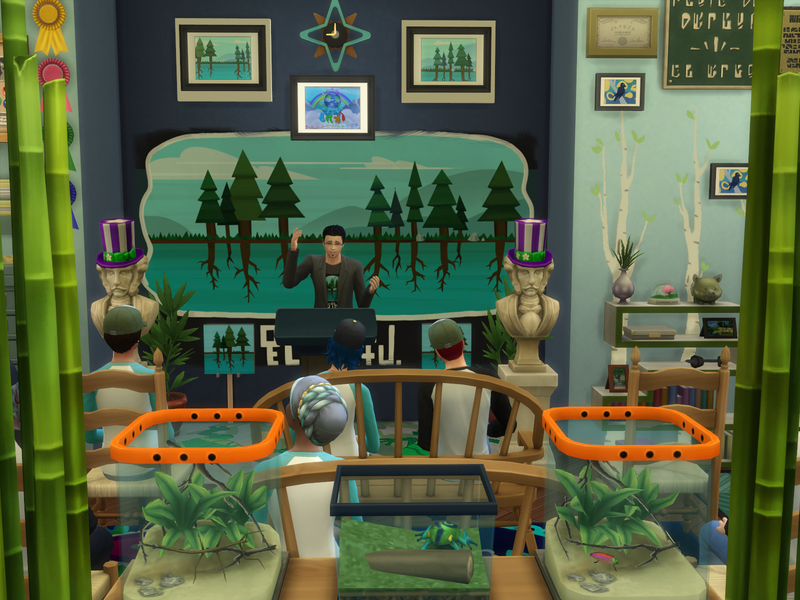 Very nice speech nook! The podium looks great! 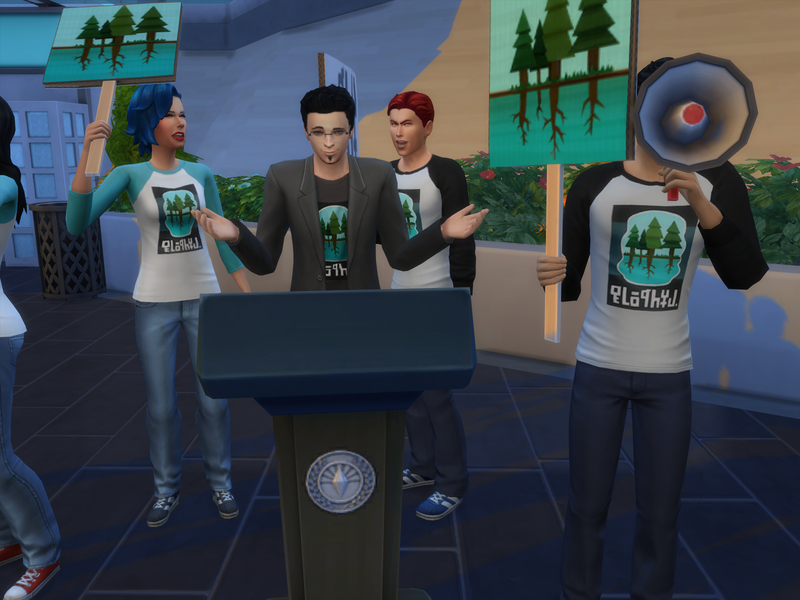 It is nice that it is nook for Graham to give speeches on the environment at the podium and listening activists can sit on the seats. The purple top hat statues on each side of the nook looks great! The frog floor prints are a nice touch. The glass cases of insects look great in the room. The patterned curtains and patterned floor rug are very nice touches in the room. 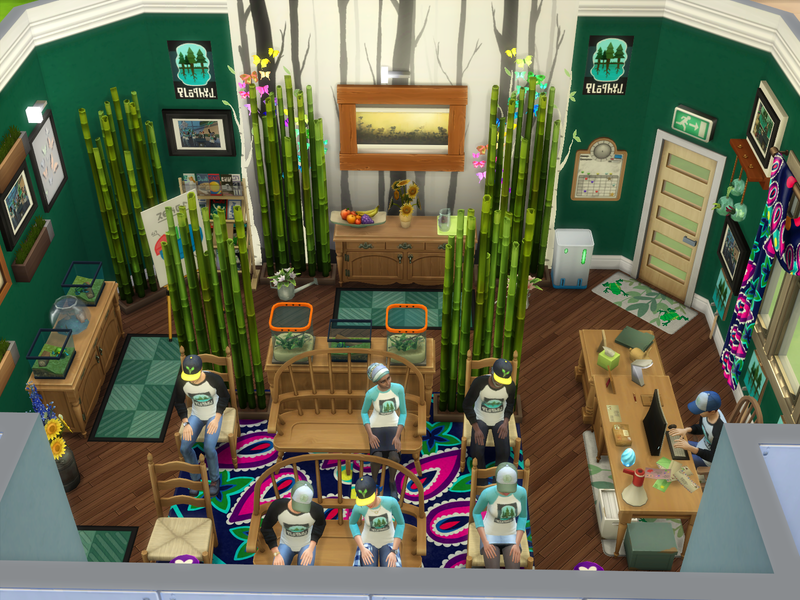 The bamboo plants add to the very nice nature look in the room. 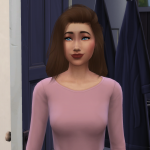 It is nice that there is a bowl of fruit for the sims to enjoy eating some fresh fruit . 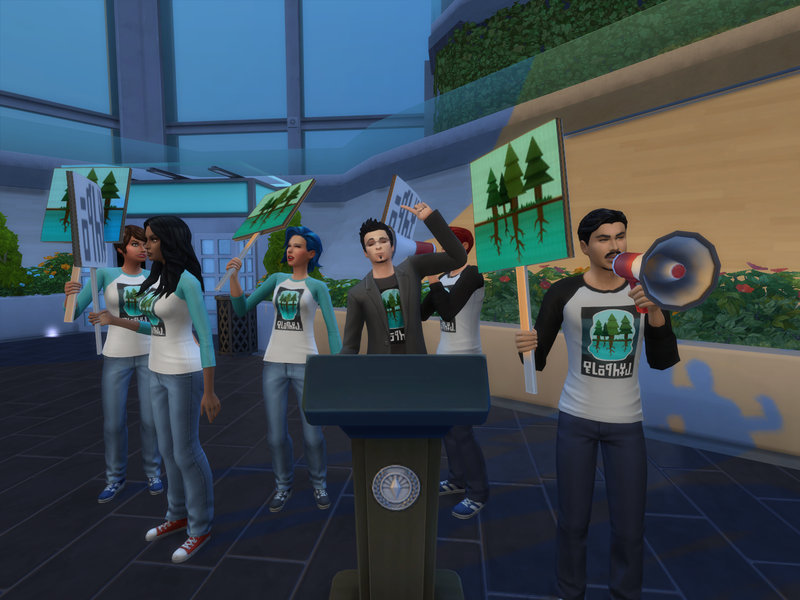 The furnishing of the room for an environmental activist looks great! 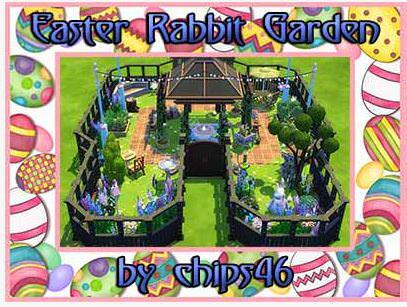 The design and furnishing of Easter Rabbit Garden looks very nice! Very nice roof covered pergola area in the middle of the garden room! 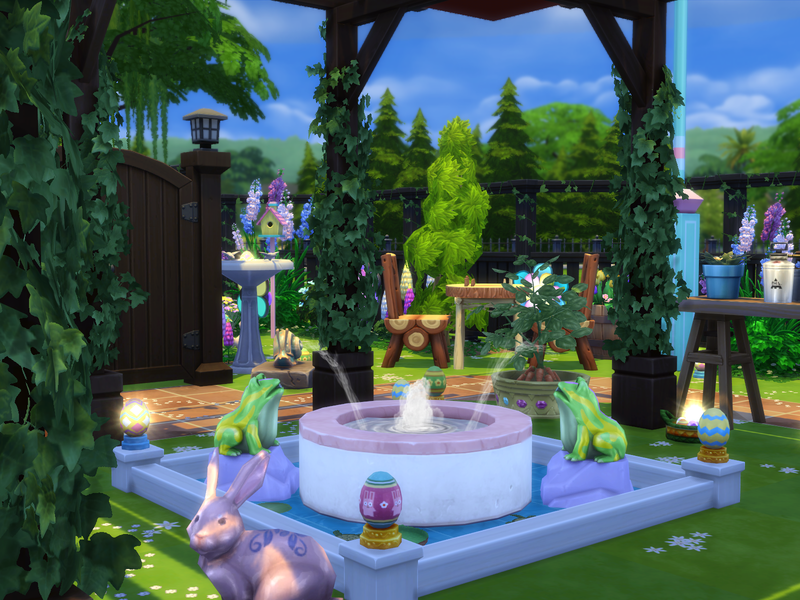 The circular water fountain with Easter eggs on the corners and frogs feature looks very nice! 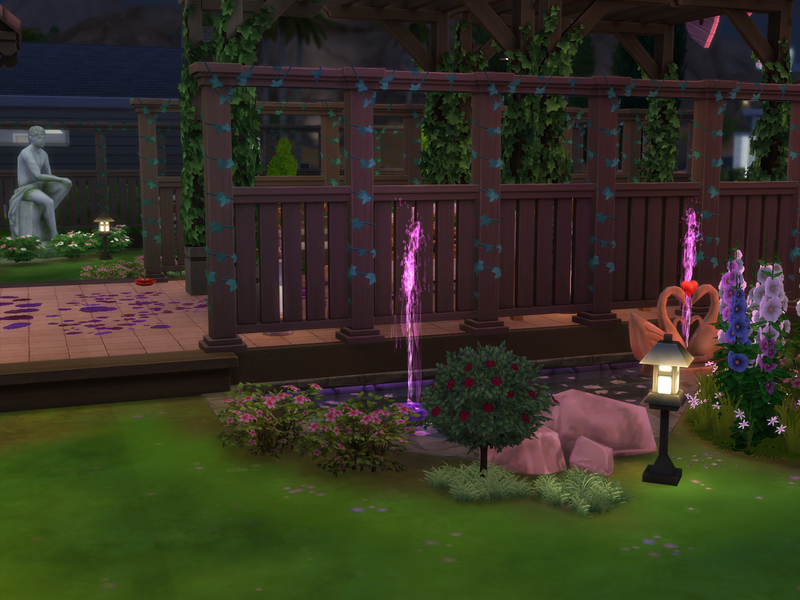 The overhead string lights look very pretty! 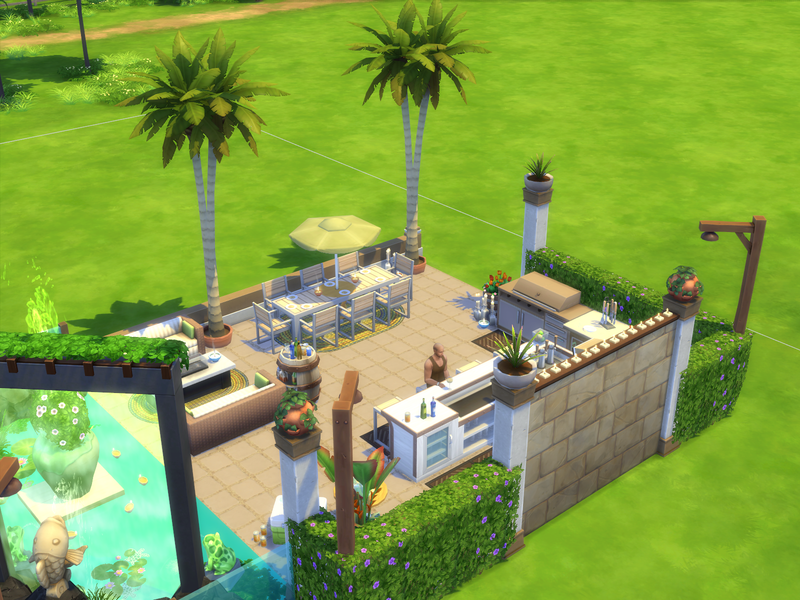 Very nice corner nook outdoors dining area, for Sims to enjoy eating food at the round table in the sunshine. 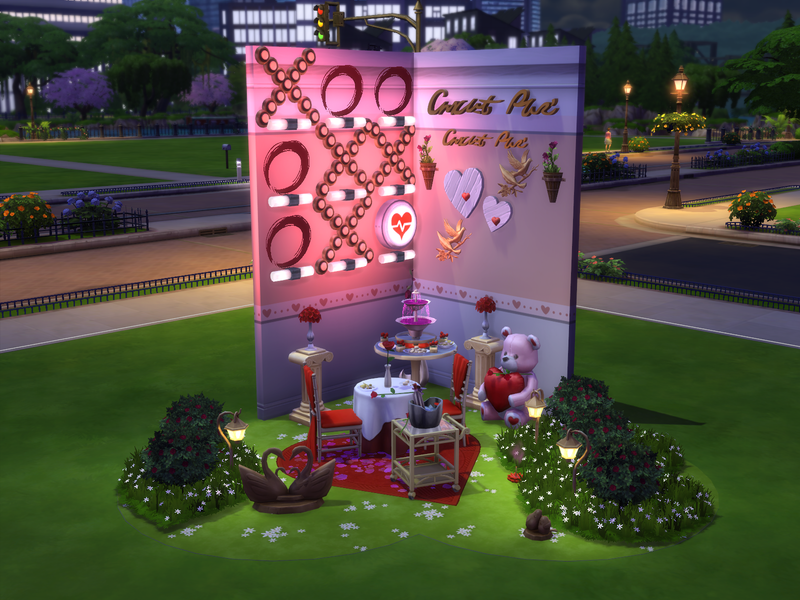 Sims will have fun playing chess on the wooden chess table. The flowers look so pretty in the room! 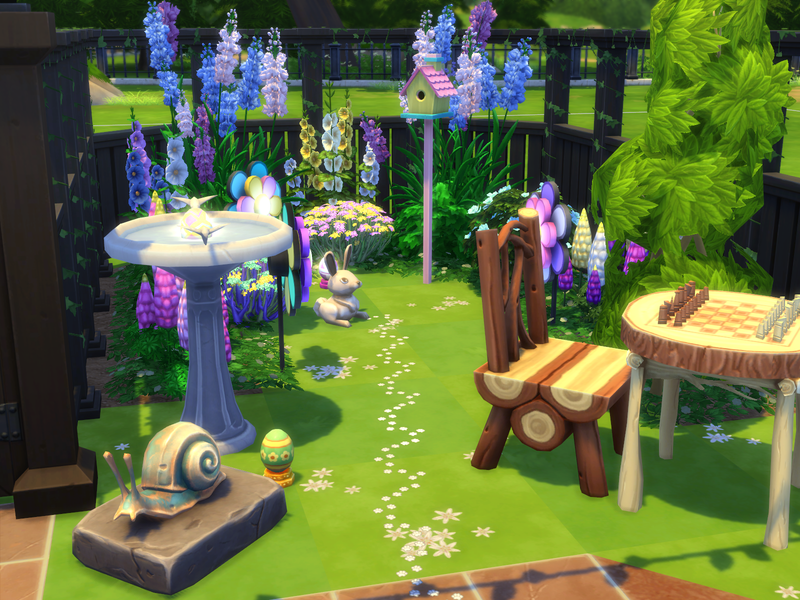 The birdbath, spinning flowers, and birdhouse are nice touches in the garden. The snail item is great there! The multi coloured large bunny and the other small bunnies are cute! 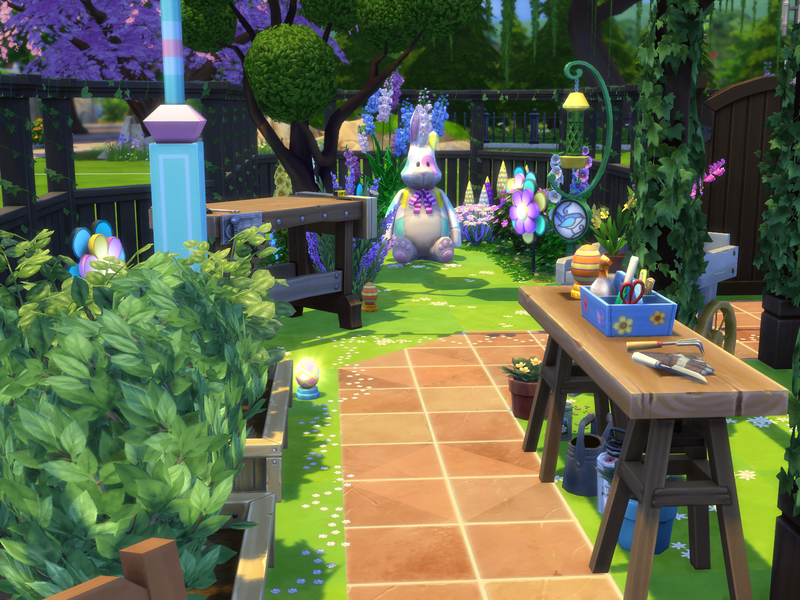 Nice woodwork nook for sims to enjoy crafting on the workbench in the midst of the pretty floral and garden setting. They will enjoy watching birds feeding on the seed feeder. The potting garden stool table looks great with the gardening items on it. 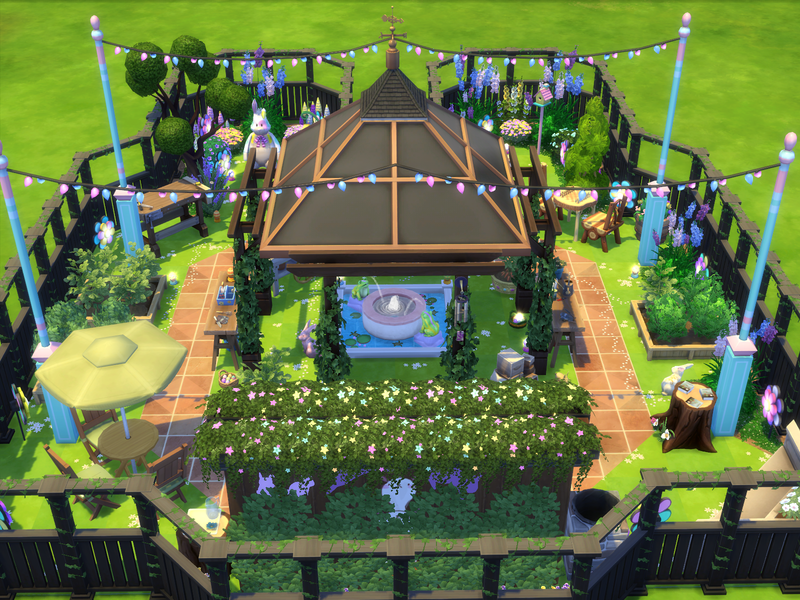 Very nice corner sofa seat sitting nook for Sims to enjoy reading in their garden. 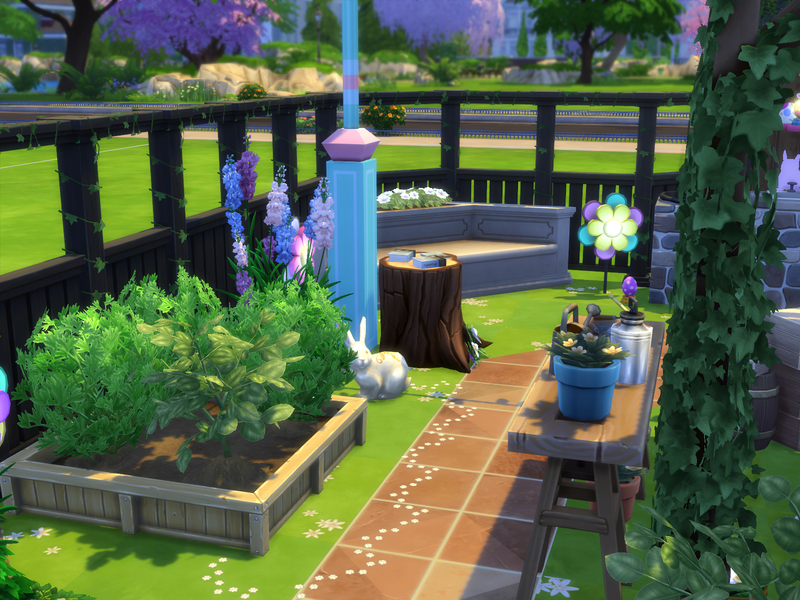 It is a very pretty floral and harvestable garden room!